I hate chili cook-offs. They seem to be everywhere this time of year. Every local festival or state fair has the obligatory bbq rib competition and chili contest. I love the ribs. I hate the chili. I hate it for two reasons. First is the predictability. The "chefs" are predominantly middle-aged, goateed, distended bellied males, (though you occasionally see the goateed female), all of them touting their chili as the best because of their "secret" spices, or their "special" combination of meats. Yeah right. Ground rabbit and alligator chunks are not going to overcome the obese seasonings these chefs insist on dumping in their pots. Face it, you've had one bowl of chili, you've had 'em all. The other reason I hate chili cook-offs is the heat. Every single chef has to regale you with how much heat he's introduced. " I use the hottest peppers". "I use the most peppers". "I use the most, hottest peppers". Greeeaaaat. It's hard to notice any taste in chili if the cook insists on incinerating your taste buds. To me a chef who uses too much heat is a mediocre chef. Heat is a cheat. It covers up lack of flavor, substituting a burning sensation for taste. I like my heat subtle, I like heat to add intrigue to my meal, not indigestion. I like heat with some sweet. Which brings us to today's recipe. Jalapeno Pepper Glaze. This recipe comes from something I saw on "America's Test Kitchen" on PBS. There was no specific recipe, just a blur of ingredients dumped into a blender. The base of this glaze is jalapeno pepper jelly; it's more of a pepper flavor than heat. I prefer it with leg of lamb over mint jelly. I'll be using Tabasco brand Jalapeno Jelly because it seems to the most widely available. 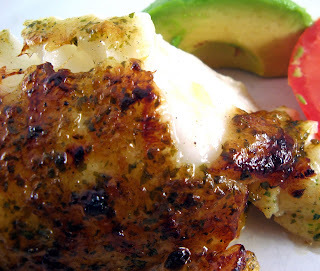 It is a great marinade/glaze for chicken, fish or beef. 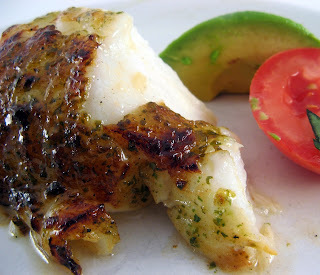 Today's photos show it over grilled halibut. Enjoy, and don't worry, it won't burn up your mouth. Combine all the ingredients (except the optional jalapeno) in a blender. Pulse until well blended. Taste your mixture. If you like more heat in your glaze, add the additional jalapeno. Transfer to a jar and refrigerate. This jelly should last at least a few weeks. I spread a light layer onto whatever meat I'll be grilling. For fish 45 minutes prior to cooking, for chicken and beef 2-6 hours. Since the glaze contains sugar, when grilling use a lower heat to avoid burning. OK, there you have it, sweet, heat and you can still taste the meat (or vegetables). Enjoy. As always, remember, you can do it, you can cook. what a giggle, loved the bolg but, wow the photo is great! When matching wine and food, the sauce is the boss. And the more heat in the sauce, the more sweet you want in the wine. Sweet helps the flavors of the peppers come through, while simultaneously, counterbalancing the heat. This dish should match nicely with a not too expensive Aussie Shiraz or California Zinfandel. Yes, red with chicked because of the sauce. Clicked over here from foodgawker.com. I'm planning on making a jalepeno glaze tonight to serve over chicken but I was planning on using a peach marmamade as the base. Nice to see this recipe though, gives me some ideas to work with. Looks yummy! That jalapeno pepper glaze sounds good.